I've already posted one of my favorite paintings in the world, which is the Madonna del Parto of Piero della Francesca, in Monterchi. 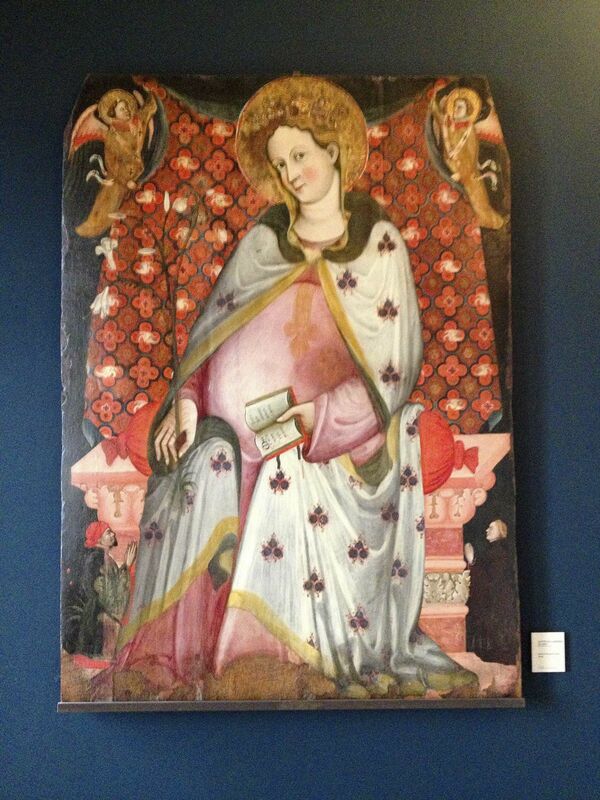 Despite a lifelong passion for Italian painting of the Quattrocento, I'd actually never known there were other representations of this same theme - of the Virgin Mary contemplating her own pregnancy and its implications. For Piero, whose work - along with Giovanni Bellini's - is the very definition of what "gravitas" even means, such a representation could hardly have been a more serious issue, as he, and therefore she - the Virgin he painted & therefore we can actually see - shows us. So now I'm posting another image, from a snapshot taken in the Accademia, where another Madonna del Parto is right up there larger than life, or at least delighted to be its source. Maestro della Madonna del Parto angeli e donatori, tavola, 188x138cm, fifteenth century. The painter of the Accademia panel - identified on the tag only as the "Maestro della Madonna del Parto", which is not terribly helpful, since we knew that much already - has an entirely different understanding than Piero. For that painter, the Virgin is pretty much as is the other gal, also in the Accademia, I posted earlier: an obviously nice and affectionate Italian mother completely delighted to be the literal matrix of the Virgin Birth of the Son of God and the Second Person of the Holy Trinity.